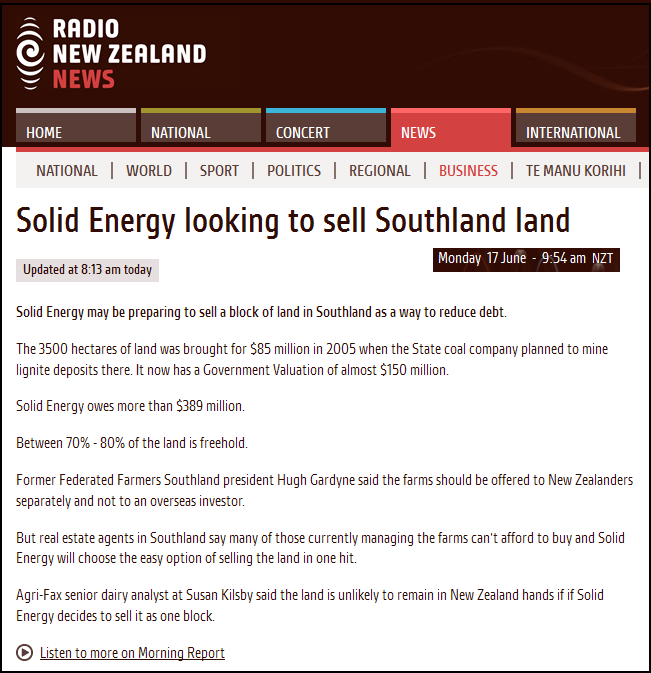 Stupidity heaped upon government incompetence – there is no other way to describe the fiasco that Solid Energy has become since National took office in 2008. Whether it was National Ministers encouraging Solid Energy to expand their operations during a time of recession or forcing it to borrow huge sums and then pay it to the National government as “dividends” – Key, English, Joyce, et al have a lot to answer for. News that Solid Energy may be planning to sell 3,500 hectares of land, and which may be purchased by offshore investors, is the final humiliation. I don’t care if a foreign purchaser resides in Boston, Berlin, or Beijing. The negative economic consequences to New Zealand are all the same. Rightwingers maintain that it doesn’t matter if the land is sold into foreign ownership; “no one can take it away”. But that’s not the point. It’s not the land that is removed – but the profits generated for owners. It is dividends to overseas investors that can be “taken away”, thereby reducing our income; worsening our balance of payments; and ultimately pushing up interest rates. Land sales to overseas investors denies the birthright of all New Zealanders to participate in land based enterprises. It is difficult for young people to buy a farm when competing with wealthy investors from Boston, Berlin, or Beijing. In the end, those young New Zealand may end up tenants in our own country – which Dear Leader himself said was not desirable (see: PM warns against Kiwis becoming ‘tenants’ ). The most common sense solution to this problem (I refuse to call it an “issue”) is simple and straightforward. If local buyers cannot be found, the land should be transferred to SOE Landcorp, to hold it in stewardship. Good, productive farmland could be later sold/leased to young New Zealanders who want to get on the first rung of the ladder to farm ownership. Selling/leasing to the next generation of New Zealanders – our children – is a sound way to give them opportunities in our own country. Why we would deny them that birthright and instead prefer to sell to faceless foreign investors, sitting in offices halfway around the word, defies understanding. As Bruce Jesson said in his book, about the neo-liberal mentality to sell off everything to the highest bidder, and bugger the consequences; Only their Purpose is Mad. 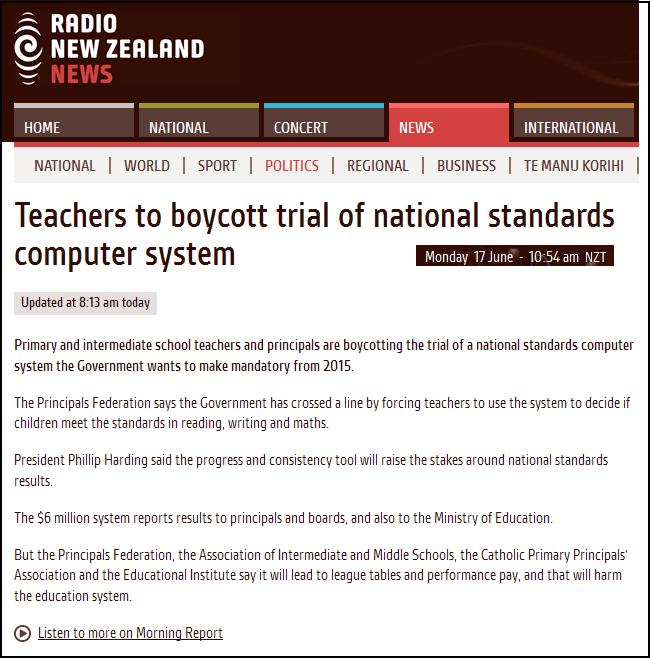 It is a great shame that Mediaworks is in this position. Their flagship broadcaster, TV3, has raised the quality and standard of programming in this country. 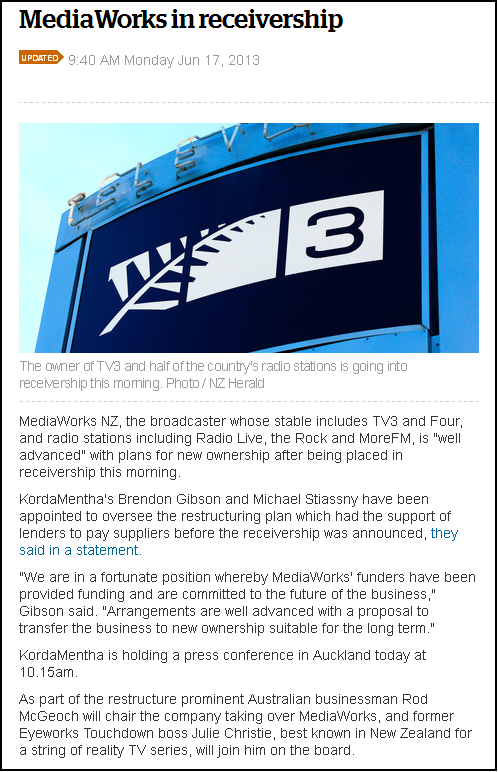 Unlike the mediocre rubbish on state-owned TVNZ, TV3 has treated the viewer with a fair measure of respect. Programmes like Campbell Live, Outrageous Fortune, and Inside Child Poverty have been nuggets of gold at a time when mainstream media is dumbing down faster than John Banks’ integrity post-Skycity and Dotcom donations scandal. This leftwing blogger wishes the company all the best for the future; fervantly hopes that no one loses their job; and looks forward to more high-quality programming from TV3. The main risk is that national testing will foster mechanical ways of assessing of children’s learning, as teachers get pressured into ‘teaching to the test’ – thus narrowing what they teach, and fuelling a focus on simplistic measuring rather than on creating a richer, and more child-oriented environment. Quite simply, what this means is that for schools to “look good” in league tables (another right wing invention that inevitably follows National Standards), they will be pressured to teach students solely to answer tests. Nothing more, nothing less. Because otherwise, a school risks looking poorly in National Standards results. Couple this with “performance related pay”, and “teaching to the test” to guarantee a high ranking in League Tables, becomes a dead cert. Parents should not only be worried – they should be downright angry. This undermines our education system and turns it into a farce. Kids become expert at answering tests – but not much more. Problem-solving, initiative, increased knowledge, and even more tradition curricula, become secondary. Because, really, if we’re going to have “performance related pay”, then teachers will make damn sure that their school doesn’t fall behind in any National Standard and subsequent League Table. That’s the secret: when you spend all your time preparing for tests, and when students are selected based on their test-taking abilities, you get outstanding test scores. Is this education?. Or is this a corruption of education and turning our children into mass-trained cogs, able to pass tests, but not much more in terms of free-thinking and expanding knowledge? Make no mistake. This is setting us up for failure in the decades to come. In his country, Dr. Darling-Hammond said later in an interview, teachers typically spend about four hours a day in the classroom, and are paid to spend two hours a week on professional development. At the University of Helsinki, where he teaches, 2,400 people competed last year for 120 slots in the (fully subsidized) master’s program for schoolteachers. “It’s more difficult getting into teacher education than law or medicine,” he said. Both Dr. Darling-Hammond and Dr. Sahlberg said a turning point was a government decision in the 1970s to require all teachers to have master’s degrees — and to pay for their acquisition. The starting salary for school teachers in Finland, 96 percent of whom are unionized, was about $29,000 in 2008, according to the Organization for Economic Cooperation and Development, compared with about $36,000 in the United States. More bear than tiger, Finland scorns almost all standardized testing before age 16 and discourages homework, and it is seen as a violation of children’s right to be children for them to start school any sooner than 7, Dr. Sahlberg said during his day at Dwight. He spoke to seniors taking a “Theory of Knowledge” class, then met with administrators and faculty members. 1. Don’t vote for National in 2014. 3. Be wary of simplistic rightwing agendas. 4. Don’t vote for National in 2014. He Couldn’t handle the Truth… The GCSB – when plain english simply won’t do.